I just made these as part of a gift for my boyfriend’s mum’s birthday (hence the otherwise elaborate pink box). This recipe makes 15, I have already eaten two… whoops! Despite the fact traditional Florentines are finished with dark chocolate, I did half milk chocolate, and half white chocolate, because what goes better with pistachios and cranberries more than white chocolate?! Line a large tray with grease proof paper and spoon 6-8 large teaspoons of the mixture onto the tray… try and make sure there’s as much space as possible between the spoonfuls, these guys spread like mad! Take out of the oven and allow to cool before transferring to a wire cooling tray… be careful when moving the Florentines, before they’re properly cooled they’re super soft, and afterwards they pretty fragile, so be careful. 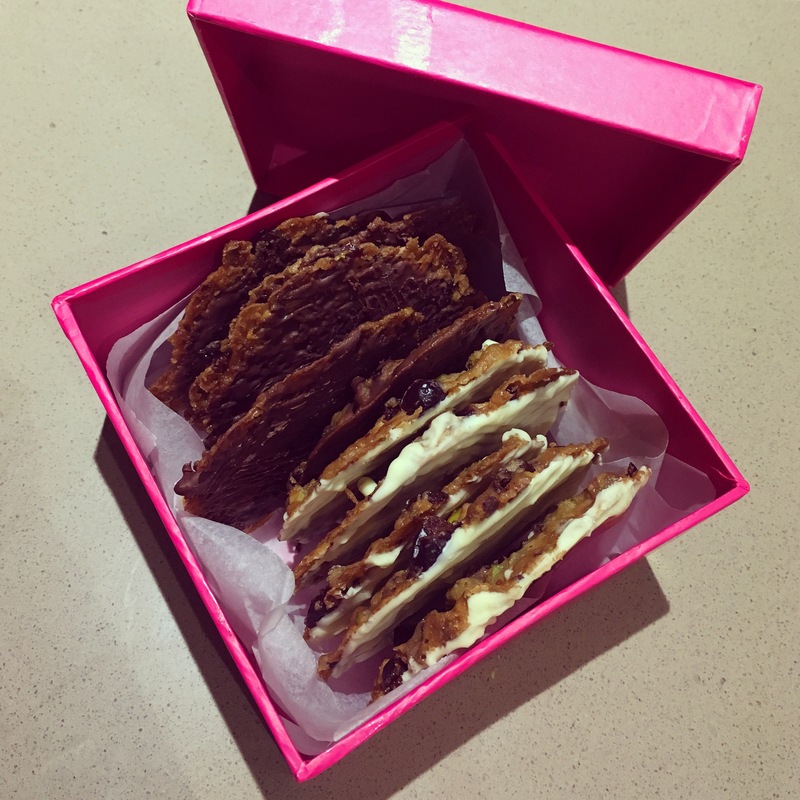 When completely cooled, coat the underside of the Florentines with the chocolate of your choice. To keep it traditional you can make grooves in the chocolate with a fork as it starts to cool.